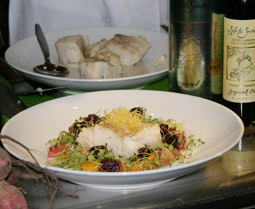 Grapeseed Oil Poached Halibut - A recipe from Savor California, the online showcase for extraordinary gourmet foods and beverages from California. With marinated beets, arugula, and ginger vinaigrette. Recipe courtesy of Chef Mark Dommen of One Market Restaurant. Wash and scrub the baby beets, removing the greens about an inch above the beet. Cover the inside of a large ovenproof skillet with about 1" of rock salt. Put the beets on top of the rock salt and bake in a 350-degree oven for about 30-45 minutes depending on the size of the beets. You will want them to be tender to the point that a toothpick could be easily inserted into them. Remove from the oven and allow to cool until you can handle them with your hand. Peel the beets and place in mixing bowls keeping each color separate. Marinate the beets with the ginger vinaigrette. While the beets are roasting, peel the ginger and using a mandoline slice 16 very thin pieces, slicing the ginger lengthwise, then with a french knife, cut the ginger into a julienne. Set aside a small piece of ginger for later use. In a small saucepot heat the grapeseed oil to 250 degrees and add the ginger, fry until golden brown. Remove the ginger from the oil and place onto a paper towel, sprinkle with salt and set aside. Allow the oil to cool, it will have acquired a nice ginger flavor and you will use it to cook the fish for this dish. Transfer the ginger-infused grapeseed oil into a small pan large enough to hold the four pieces of fish so that they will be covered with oil. Cool the oil to about 225-230 degrees, add the thyme, and bay leaf and allow to infuse. Season the fish with salt and fresh ground pepper and put into the warm grapeseed oil. The fish should take about 8-10 minutes to cook. While the fish is cooking, arrange a nice mixture of beets on four plates. Dress the arugula with some ginger vinaigrette and scatter it over the beets. When the fish is cooked, remove the fish from the oil and place on top of the baby beets. Garnish with some fried ginger. Put all the ingredients in a blender and blend well, check the seasoning to make sure there is enough salt and pepper. Strain the vinaigrette through a fine mesh strainer. It's ready to use. Make note, it doesn't have to be an emulsified vinaigrette; it's okay if it breaks.